My book touches on many aspects of human nature. However, I regard the nature/nurture dichotomy as false. Nature refers to the end products of development and nurture to how they got there. The innate/learned, robust/plastic, hard-wired/soft-wired, and genetic/environmental dichotomies all incorrectly imply that human characteristics come in two forms. They ignore the ways in which the developing individual is in a constant state of transaction between itself and its environment. The specific ways in which plasticity occurs depend on robust rules and plasticity may produce robust outcomes. I believe that the popularity of the old dichotomies is fading but may be retained because they are deeply rooted in folk biology and provide a spurious sense of understanding. A theme that runs through the book is about the adaptive processes that give rise to the appearance of design in nature. The appearance might derive from historical processes of Darwinian evolution from the individual’s adaptability or both. Not all an individual’s characteristics are adaptive in the present. The dietary preferences that were adaptive in the past, such as those for salt and sugar, can seriously disrupt health when these substances are readily available in modern societies. Similarly, the tendency of parents to protect their children from all contact with unknown people after hearing from the media of a child murder would have been beneficial in a small community where such news might represent real danger. In the modern context, such risk-averse behaviour in a society in which the incidence of child murder has remained constant for decades merely impoverishes the child’s development. The appearance of design can generate misconceptions. Even so, when processes like behavioural imprinting in birds and attachment between mother and child are examined, it is reasonable to suppose that these processes play an important role in the development and survival of each offspring. Understanding the rules that underlie the development of the individual and the reciprocity between those rules and the individual’s experience are important in making sense of the complexities of development. 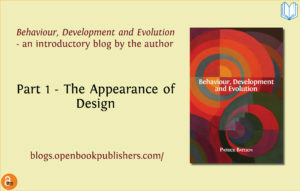 You can read Behaviour, Development and Evolution for free here. Move forward to part two or part three.